U.S. Sues Operators Of Pirate Radio Station That Aired Alex Jones' Show The operators told the FCC they didn't recognize its right to regulate them. They were hit with a $15,000 penalty "for willful and repeated violation" of laws. Now the FCC has brought in the DOJ. An antenna tower is seen at the Orchard Plaza apartment building in Austin in 2014, the year the FCC imposed a penalty on the building's owners for operating a pirate radio station. To collect the debt, the Justice Department recently filed a civil suit against Walter Olenick and M. Rae Nadler-Olenick, demanding the married couple pay the FCC's penalty "for willful and repeated violation" of U.S. law. 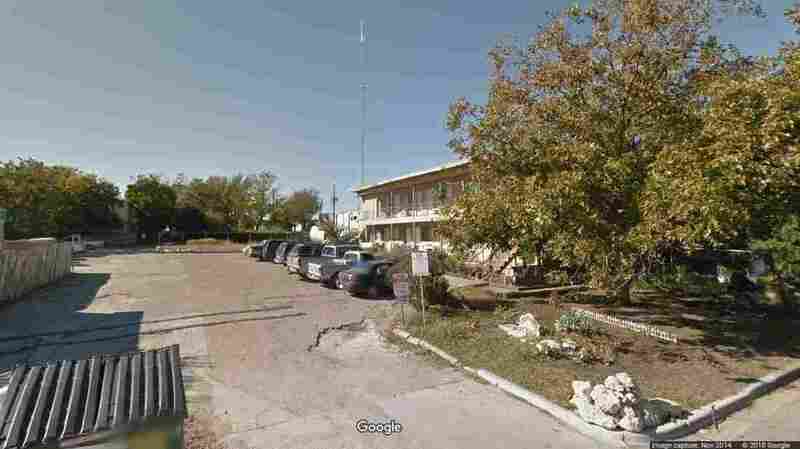 They're accused of operating a pirate radio station; Texas Liberty Radio has been unlicensed at least since 2013, according to the FCC. On its website, Texas Liberty Radio says it stopped broadcasting when it lost tower access in December 2017. But for years, Olenick and Nadler-Olenick have been fighting the FCC's attempt to enforce federal laws, insisting the agency doesn't have any power over them. Jones' Infowars media company told NPR in an email that the controversial radio host has had no direct connection to Texas Liberty Radio. But the station's past broadcasts of his program earned it the moniker of the "Austin flagship" for Jones, according to the Austin American-Statesman. The Associated Press and Inside Radio have also referred to it as the flagship — raising the ire of one of the station's hosts, Danny Sessom, who said late Wednesday night that TXLR only rebroadcasts Jones' radio show. Calling it anything else, he said, was "actual fake news." When the FCC first penalized Olenick and Nadler-Olenick in 2014, The Austin Chronicle noted that the 90.1 FM frequency "has aired New World Order warnings for more than a decade, earning it the nickname 'Alex Jones Radio.' "
In a string of correspondence with the FCC, Olenick and Nadler-Olenick dismissed the agency's claims against them as preposterous and unfounded, saying in essence that they never agreed to be regulated by the U.S. government. The FCC has been both praised and criticized for acting against the radio station — something that FCC Chairman Ajit Pai brought up Thursday during previously planned testimony before the Senate commerce committee. "It is important to make clear that our pirate radio enforcement efforts — including this one — have nothing to do with the content of pirate radio stations air," Pai said, according to the FCC's transcript. "We act against pirate radio station because they are violating the law by broadcasting on the FM airwaves without a license." In the Austin case, Pai noted, the station's operators were fined only after they ignored a warning to stop broadcasting illegally. The case began in 2013, when the FCC received a complaint about an illegal transmission on the 90.1 frequency in Austin. The FCC's enforcement agents used directional equipment to trace the source of the rogue signal to a 50-foot tower erected at a property owned by the Olenick and Nadler-Olenick. The tower's antenna was wired to equipment in a utility or maintenance room, the agents said. They also "observed a vehicle bearing a bumper sticker reading "Liberty 90.1 FM" parked in front." The agents used county records to determine who owned the property. In September 2013, the FCC sent a letter to Olenick and Nadler-Olenick, warning them of the penalties of running an unlicensed radio station and giving them 10 days to respond. The pair sent a rather extraordinary response, alternately telling the agency to "kindly never bother us with your harassment under color of law and office again" and saying that if the FCC wanted to communicate further, "knock yourself out." The demands in the FCC's letter were "facially preposterous," they wrote. The couple also seemed to assert rights reserved for foreign states, telling the FCC, "We expect that letters so addressed would more properly come from your company's International Bureau and then only after there's been some treaty of other discovered to which we are signators." It's unclear whether Olenick and Nadler-Olenick might adhere to the belief, long held among some Texans, that the state should operate as a republic rather than as a full member of the United States. The FCC's letter, we'll note, was sent to the couple's post office box in Austin. Olenick and Nadler-Olenick closed their letter by informing the FCC's enforcement bureau that its agents did not have permission to enter or visit their property, implying the agents would thereafter be considered trespassers. A string of further letters followed much the same pattern, and in early 2014, the FCC imposed the $15,000 penalty. Olenick and Nadler-Olenick didn't pay, and in November of that year, the agency sent a letter threatening to bring in the Justice Department. Instead of seeing the penalty notice as an official warning of impending action, Olenick and Nadler-Olenick said they took a different view of the FCC's citation of federal regulations. They wrote: "We look at the same compilation of words and see Monte Hall's, 'Let's Make a Deal! ', i.e., an offer. We decline your offer, as we have from the outset, and we will forever decline your offer." Olenick and Nadler-Olenick repeatedly referred to the FCC as a company, as when they stated in a letter to Susan Launer, the FCC's deputy associate general counsel, "We dispute (your company's) claim in its entirety, for reasons already documented in our prior correspondence." In that letter, Olenick and Nadler-Olenick also wrote, "Obviously, we'll be sending no check to anyone in response to your continued mail fraud conspiracy." They accused the FCC of trying to conjure a justification for the penalty, calling it "a conspiracy ... to harass us and to intimidate us for and in retaliation of our very well-documented assertion of our 'right not to contract.' "
The FCC penalty has now gone unpaid for four years, and the Justice Department filed a civil suit in federal court last week to collect the debt. That federal action comes after several large tech companies recently either banned or limited Jones' ability to use their platforms to air his shows. Twitter is the latest company to punish the conspiracy theorist, revoking some of Jones' privileges for breaking its rules against abusive behavior. Jones and others at Infowars have said they're being censored and deprived of their right to free speech. They also say the moves targeting Jones have been timed to coincide with the run-up to the midterm elections, now less than three months away. In videos posted to Twitter and elsewhere, Jones has told his followers to go directly to his website to watch or listen to his show through online streaming. Editor's note on Aug. 17: This story and its headline have been edited to restate that while Texas Liberty Radio has been called the "Austin flagship" for Alex Jones, it has no direct connection to the conspiracy theorist. Also, the story has been edited to restate that the FCC says its enforcement effort is not connected to any of the content that Texas Liberty Radio has broadcast and is only about the station's unlicensed broadcasting.